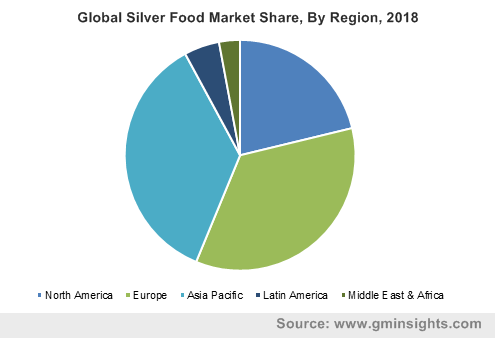 Silver Food Market size was estimated over USD 13.4 billion in 2018 and the industry will grow by a CAGR of more than 4% up to 2025. Europe Silver Food Market Size, By Distribution Channel, 2014 – 2025 (USD Million)??????? The global silver food market will be primarily driven by increasing ageing population, especially in the Asia Pacific region. Japan ranks the highest with approximately 27% of its population over 65 years. Counties such as Italy, Portugal, Germany, Finland and Bulgaria follow this trend and are among the top six nations with about one-fifth of its population above the 60-year mark. According to WHO, among the global population, more than two billion people will be in the age group of more than 60 years by 2050. This will lead to lower population in the workforce, declining GDP, rising healthcare and pension expenditure. Major factors contributing to this situation are falling fertility rates and longer lifespan in certain regions. The fast rise in ageing population will drive demand for senior friendly food products and nutritional supplements in coming years. Another factor driving the global market are rising healthcare expenditure on elderly population by governments of different countries. For instance, global healthcare spending in 2015 was USD 7.1 trillion. Out of this, the U.S. spent the highest of about USD 3.3 trillion. The global healthcare industry is expected to grow in the coming year and would cross USD 1 trillion in terms of revenue. These factors coupled with increasing awareness among consumers regarding the advantages of healthy eating habits will drive silver food demand. Rising disposable income in developing countries is another factor propelling this industry. Various government initiatives for senior citizens such as the Commodity Supplemental Food Program (CSFP), Senior Farmers' Market Nutrition Program (SFMNP), National Programme for Health Care of the Elderly (NPHCE), etc. will boost product demand and will help the global market to grow. Based on product, the global market has been categorized into meal boxes and supplements. Supplements is the largest segment in terms of revenue and will grow by a rate of more than 4% during the forecast timeframe. Meal boxes for elderly also occupies a high industry share in terms of volume. Meal boxes come in various varieties to match the changing requirements of its senior customers. Most meal boxes are ready to eat food with minimal preparation required. Various dietary requirements of the elderly population are taken into consideration by the companies offering meal boxes like gluten free, low carb, low sodium, diabetic friendly, renal diet, etc. Rising elderly population coupled with increasing number of senior citizens living alone will drive demand for meal boxes in coming years. 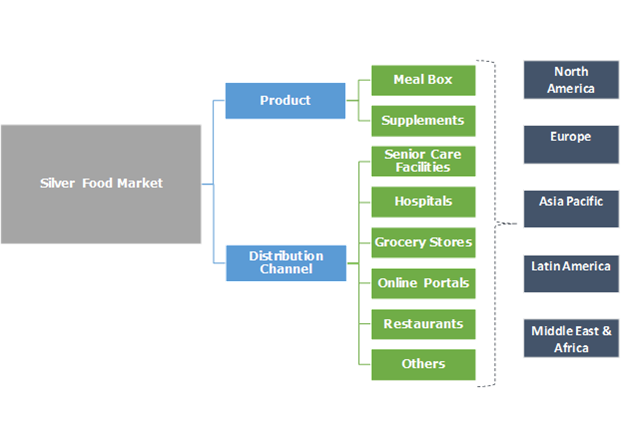 The global silver food market is segmented, based on distribution channel, into senior care facilities, hospitals, grocery stores, online portals, restaurants and others which include direct selling, other retail formats, etc. More than 24% market share is held by senior care facilities. In order to ensure the health of their patients and to follow a diet chart most of these facilities provide food that is specially made for senior citizens. Hence, this segment is expected to grow at a CAGR of more than 4% in the forecast timeframe. Hospital segment held a significant share of the overall market in 2018. Many silver food manufacturing companies sell their product to hospitals that take care of elderly patients. Rising health issues have led to increasing patients in the hospitals which in turn would increase the requirement for silver food for elderly. High growth in the global healthcare industry will augment this segment’s development and is likely to grow at a rate of about 3% during the forecast timeframe. Asia Pacific region held a significant demand in the global market and generated a revenue of about USD 4.3 billion in 2018. High sale of supplements in China, India, Japan, and South Korea will be the main driver behind the region’s top industry position. Doctors highly recommend the product, especially for the ageing population to fulfill their nutritional requirements. Increasing number of ailments in this region coupled with rising disposable income will be another important driver behind the silver food market expansion in the coming years. North America is another key silver food market which is likely to propel by a growth rate exceeding 3% by the end of the study period. Increase in the number of elderly people in this region along with problems of obesity, diabetes etc. will boost the local market in the forecast timeframe. The population is aware about the advantages of nutritional food and are increasingly demanding meal kits which incorporates natural ingredients. The growth of online portals for home delivery of food products will also help the silver food market to grow. These trends will augment product sale in the future. 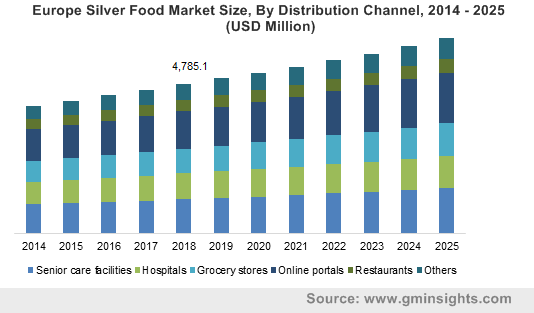 Important market players in the silver food market includes Pfizer, Nestle, DSM, Abbott Laboratories, Arla Foods Ingredients Group, bistroMD, Magic Kitchen, Dussmann Group, Carezzo Nutrition B.V., Harrogate Neighbours Housing Association Ltd., etc. The silver food market is fragmented with major market players accounting for limited share. The presence of several medium scale manufacturers mostly in the Asia Pacific region has resulted in the fragmented nature of the industry. The presence of many non-govermental associations, community services, and government backed associations in the senior health and nutrition market also increases the competition for commercial players. Silver food market emerged in recent years after realization for the need of specific dietary and other requirements for elderly population. Silver food is intended for senior citizens to cater to the specific nutritional deficiencies of the particular age group. The product is provided by non-profit organizations, private companies and government agencies. Increasing awareness about healthy eating habits has led to a rise in the number of companies providing ready to cook meal boxes and supplements to promote healthy ageing. These companies also provide home deliveries for elderly who are unable travel or cannot often visit the grocery stores. Many governments have taken initiative to boost silver food industry growth to benefit its ageing population.